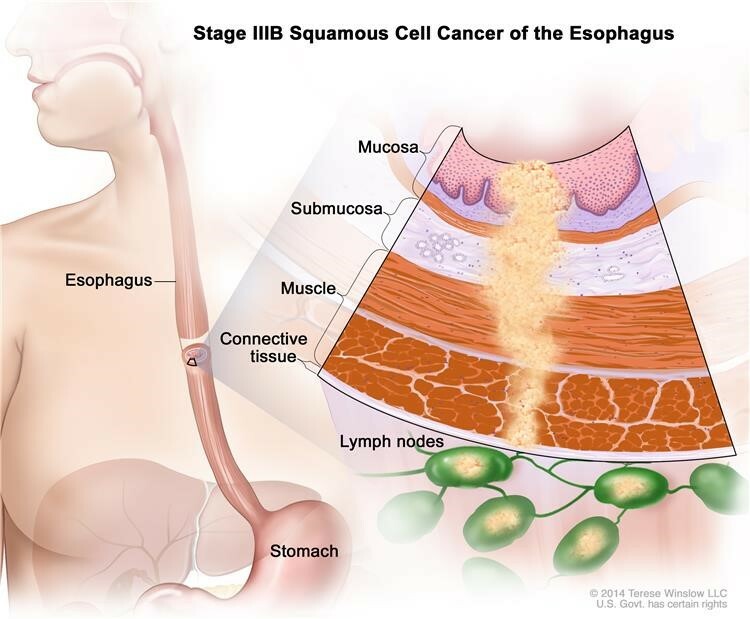 Squamous cell carcinoma:Cancer that forms in squamous cells, the thin, flat cells lining the esophagus. This cancer is most often found in the upper and middle part of the esophagus, but can occur anywhere along the esophagus. This is also called epidermoid carcinoma. Adenocarcinoma: Cancer that begins inglandular (secretory) cells. Glandular cells in the lining of the esophagus produce and release fluids such as mucus. 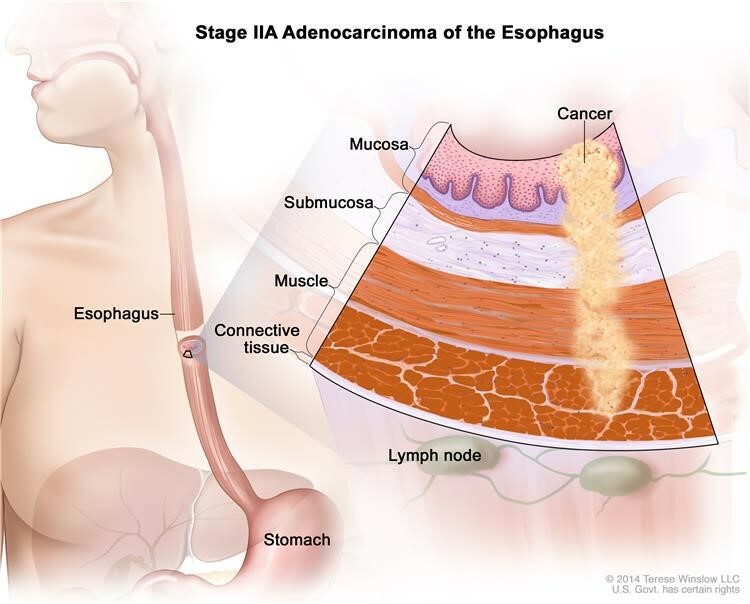 Adenocarcinomas usually form in the lower part of the esophagus, near the stomach. A x-ray of the organs and bones inside the chest. An x-ray is a type of energy beam that can go through the body and onto film, making a picture of areas inside the body. A series of x-rays of the esophagus and stomach. The patient drinks a liquid that contains barium (a silver-white metallic compound). The liquid coats the esophagus and stomach, and x-rays are taken. This procedure is also called an upper GI series. 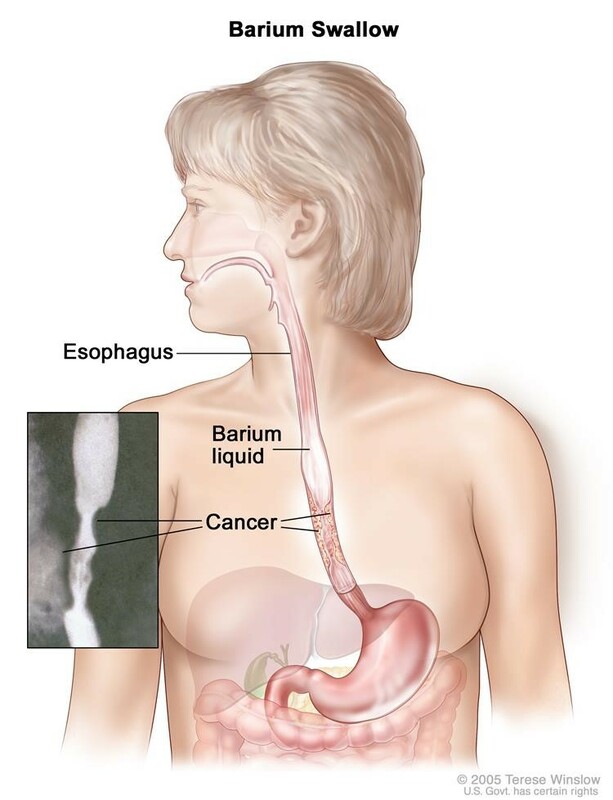 Barium swallow .The patient swallows barium liquid and it flows through the esophagus and into the stomach .X-rays are taken to look for abnormal areas. A procedure to look inside the esophagus to check for abnormal areas. 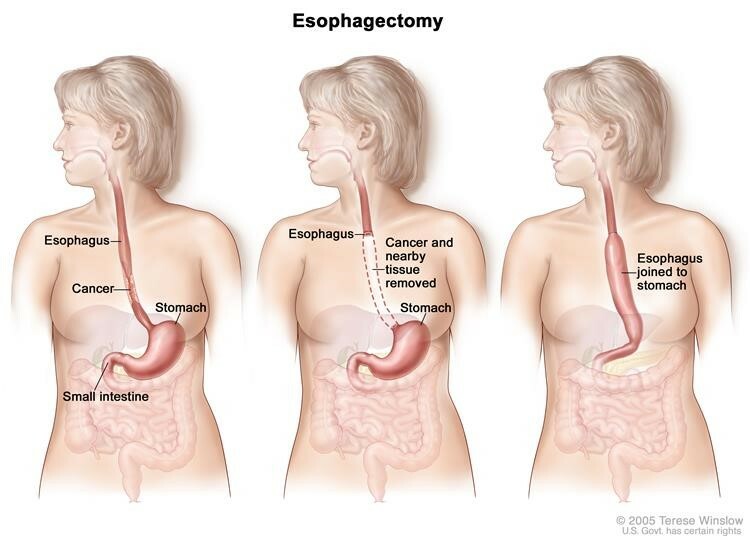 An esophagoscope is inserted through the mouth or nose and down the throat into the esophagus. 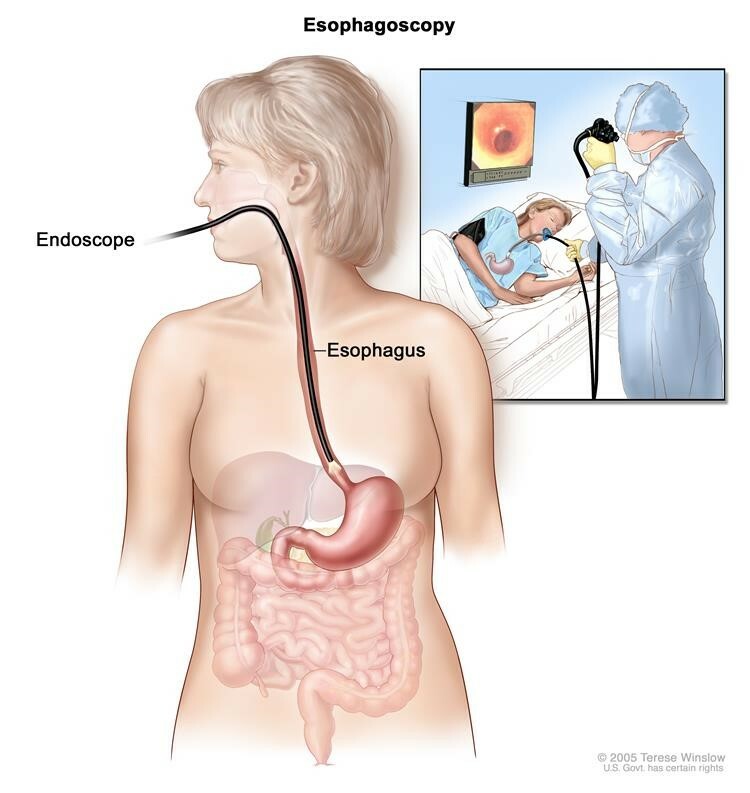 An esophagoscope is a thin, tube-like instrument with a light and a lens for viewing. It may also have a tool to remove tissue samples, which are checked under a microscope for signs of cancer. 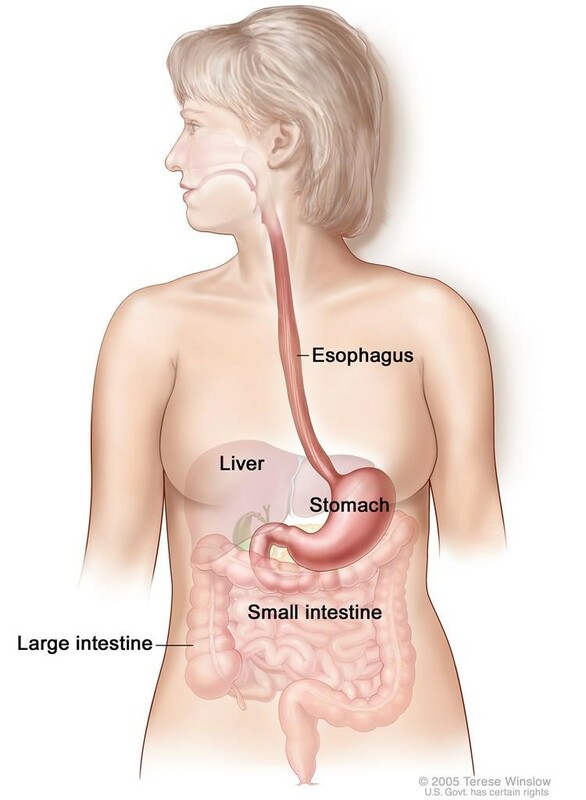 When the esophagus and stomach are looked at, it is called an upper endoscopy. The removal of cells or tissues so they can be viewed under a microscope by a pathologist to check for signs of cancer. The biopsy is usually done during an esophagoscopy. 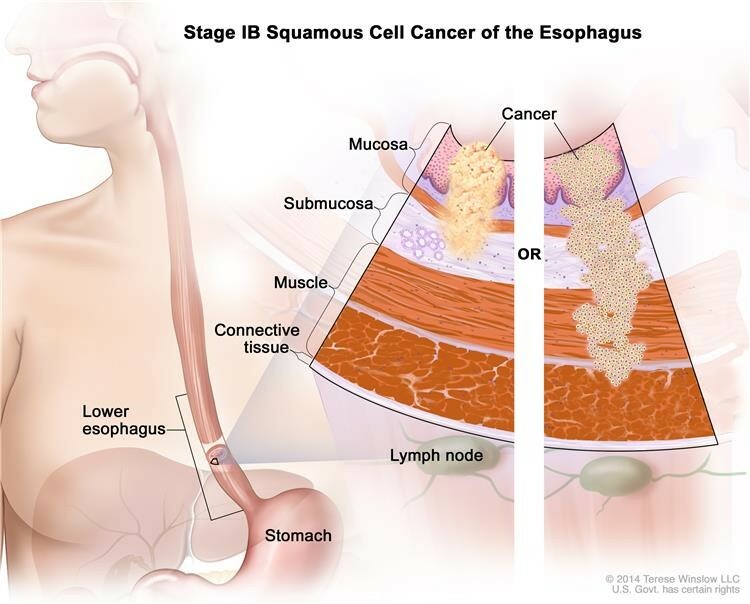 Sometimes a biopsy shows changes in the esophagus that are not cancer but may lead to cancer. 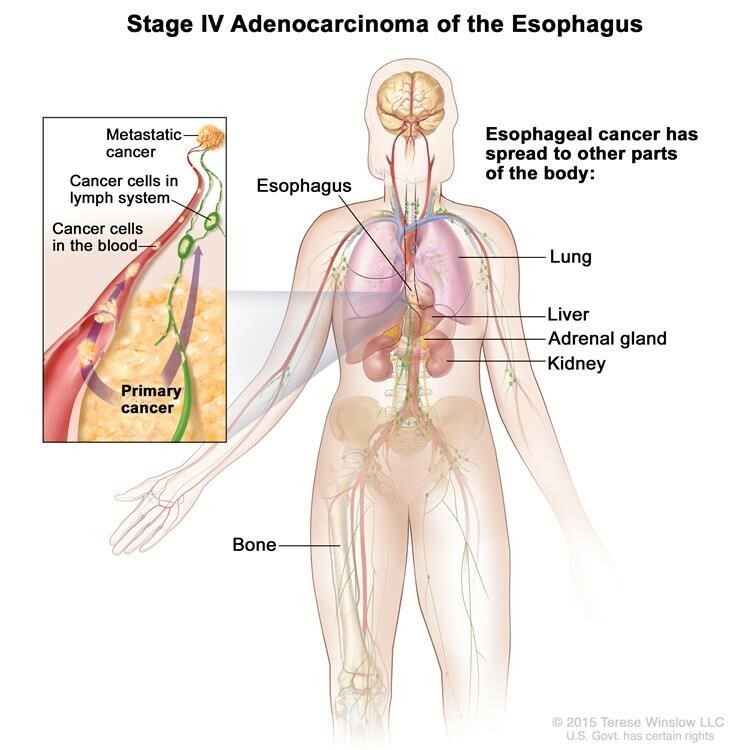 Thestage of the cancer (whether it affects part of the esophagus, involves the whole esophagus, or has spread to other places in the body). Whether the tumor can be completely removed bysurgery. A procedure that makes a series of detailed pictures of areas inside the body, such as the chest, abdomen, and pelvis, taken from different angles. The pictures are made by a computer linked to an x-ray A dye may be injectedinto a vein or swallowed to help the organs or tissues show up more clearly. This procedure is also called computed tomography, computerized tomography, or computerized axial tomography. Lymph system. The cancer spreads from where it began by getting into the lymph system. The cancer travels through thelymph vessels to other parts of the body. The cancer spreads from where it began by getting into the blood. The cancer travels through theblood vessels to other parts of the body. Lymph system. The cancer gets into the lymph system, travels through the lymph vessels, and forms atumor (metastatic tumor) in another part of the body. 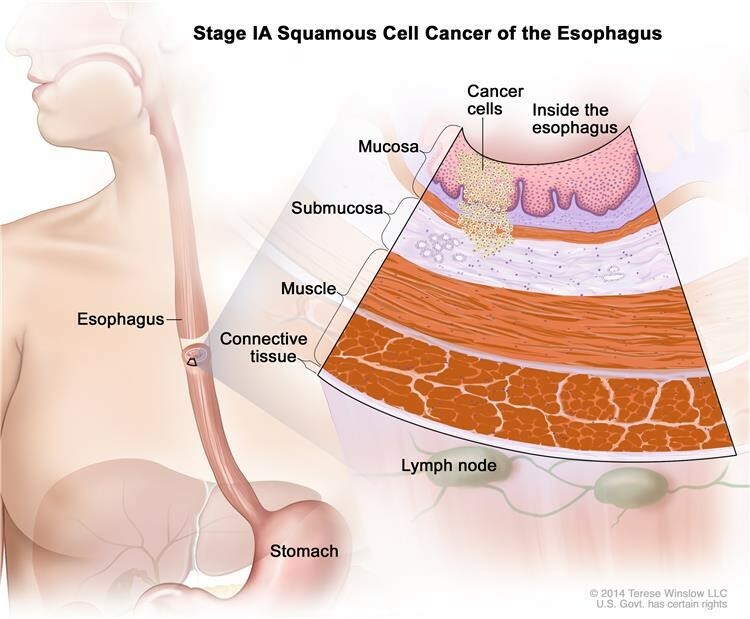 Stage IA squamous cell cancer of the esophagus.Cancer has formed in the mucosa or submucosa layer of the esophagus wall. The cancer cells are grade 1 or the grade is unknown. Grade 1 cancer cells look more like normal cells under a microscope and grow and spread more slowly than grade 2-3 cancer cells. in the mucosa or submucosa layer and spread into the muscle layer or the connective tissuelayer of the esophagus wall. The cancer cells are grade 1. The tumor is in the lower esophagus or it is not known where the tumor is. 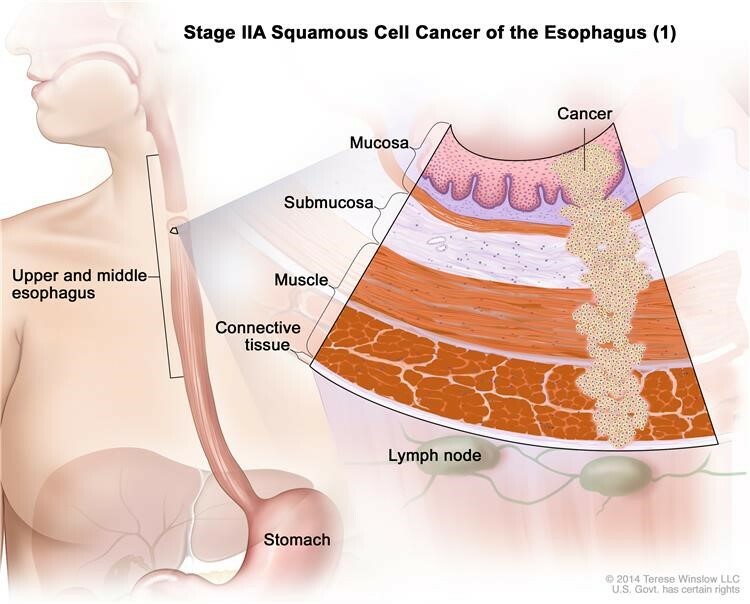 Stage IIA squamous cell cancer of the esophagus(1). The tumor is in either the upper or middle esophagus. 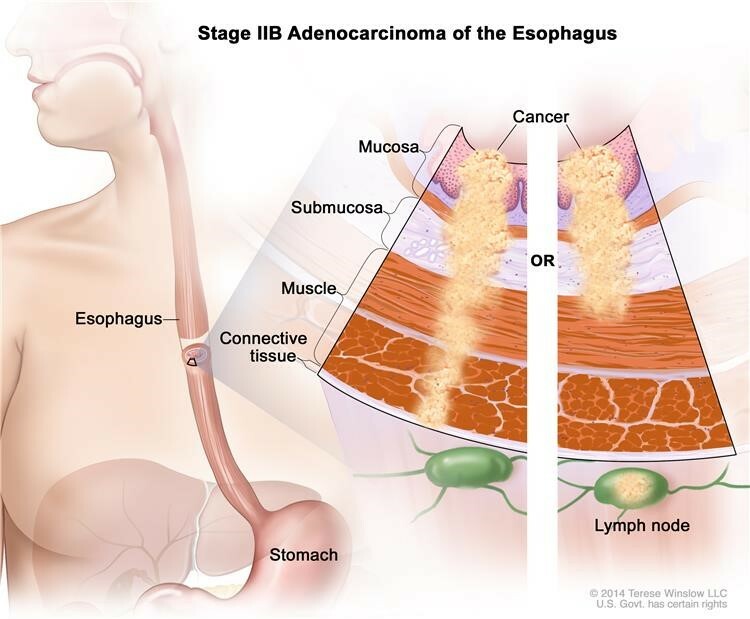 Cancer has spread into the muscle layer or the connective tissue layer of the esophagus wall. The cancer cells are grade 1 . Grade 1 cancer cells look more like normal cells under a microscope and grow and spread more slowly than grade 2-3 cancer cells. 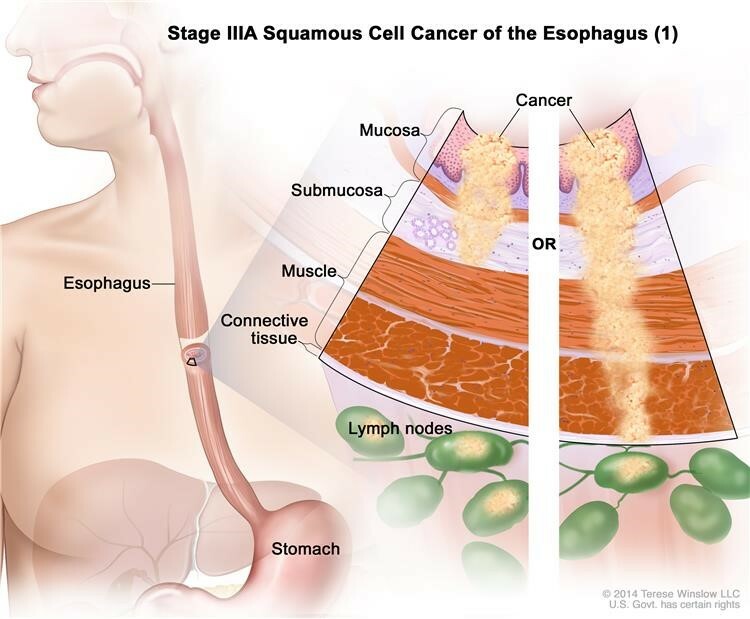 Stage IIA squamous cell cancer of the esophagus (2). 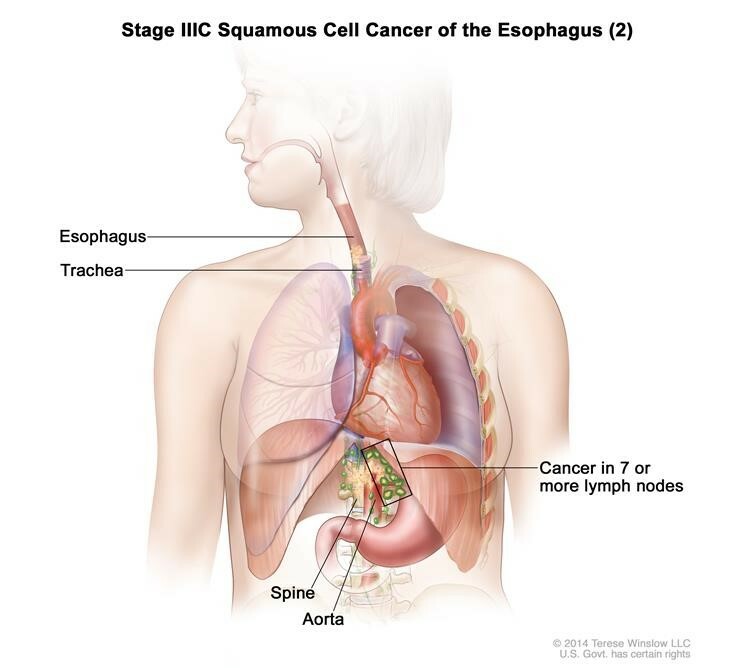 The tumor is in the lower esophagus or it is not known where the tumor is. Cancer has spread into the muscle layer or the connective tissue layer of the esophagus wall. The cancer cells are grade 2-3 . Grade 2-3 cancer cells look more abnormal under a microscope and grow and spread more quickly than grade 1 cancer cells. Grade 1 cancer cells look more like normal cells under a microscopeand grow and spread more slowly than grade 2 and 3 cancer cells. is in the mucosaor submucosa layer and may have spread into the muscle layer of the esophagus wall. Cancer is found in 1 or 2 lymph nodes near the tumor. InStage IV,cancerhas spread to other parts of the body. 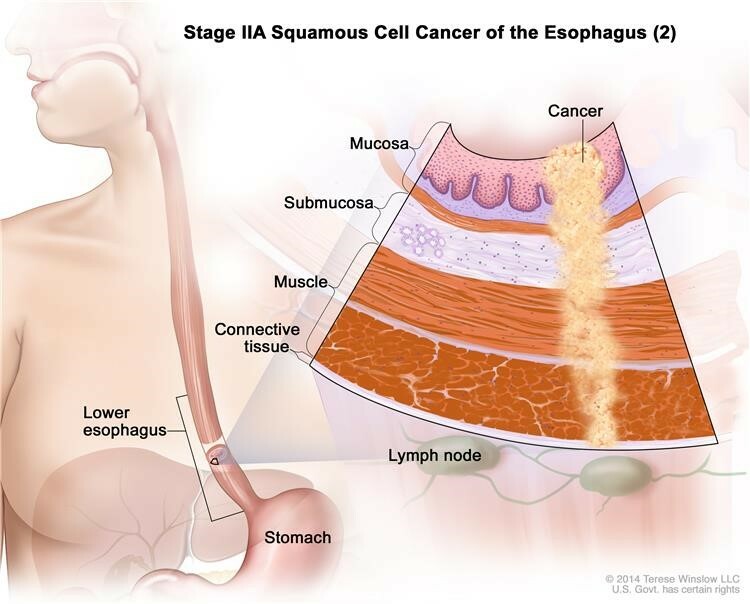 Stage IA: Cancer has formed in themucosa or submucosa layer of the esophagus The cancer cells are grade 1 or 2. Grade 1 and 2 cancer cells look more like normal cells under a microscopeand grow and spread more slowly than grade 3 cancer cells. Stage IIA: Cancer has spread into the muscle layer of theesophagus The cancer cells are grade 3. Grade 3 cancer cells look more abnormal under a microscope and grow and spread more quickly than grade 1 and 2 cancer cells. Stage IIIA adenocarcinoma of the esophagus (1). 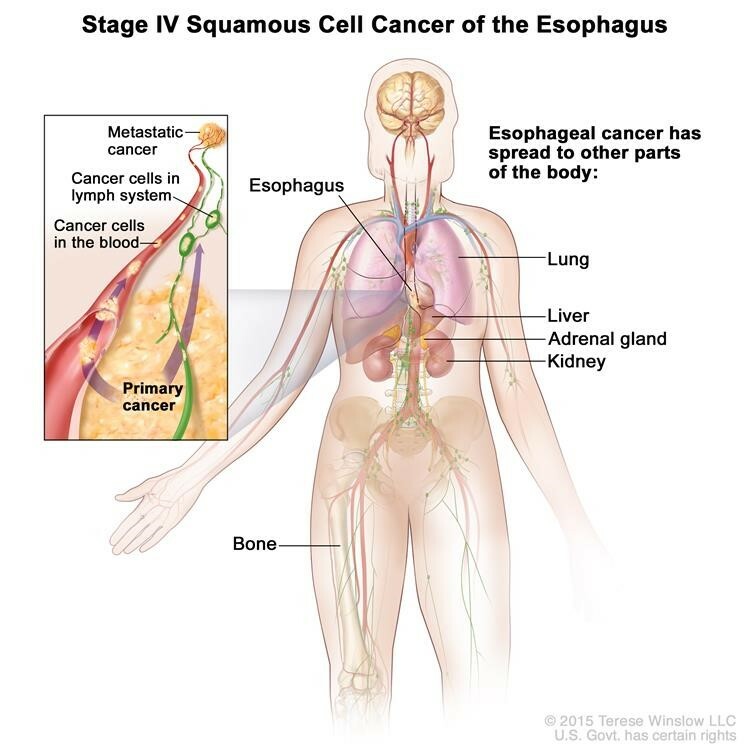 Cancer is in the mucosa or submucosa layer and may have spread into the muscle layer of the esophagus wall, and cancer is found in 3 to 6 lymph nodes near the tumor; OR cancer has spread into the connective tissue layer of the esophagus wall, cancer is found in 1 or 2 lymph nodes near the tumor. InStage IV, cancer has spread to other parts of the body. 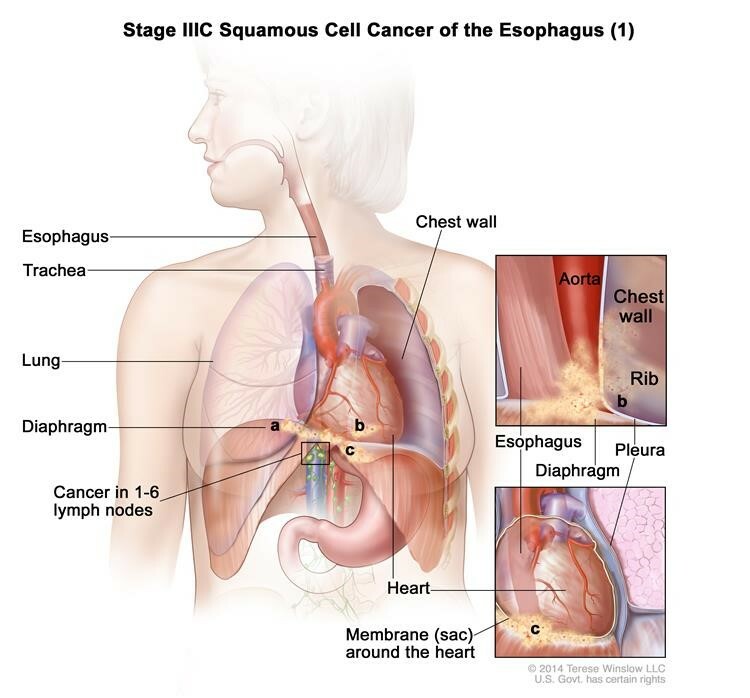 Recurrent esophageal cancer is cancer that has recurred (come back) after it has been treated. The cancer may come back in the esophagusor in other parts of the body. Different types of treatment are available for patients with esophageal cancer. Some treatments are standard (the currently used treatment), and some are being tested in clinical trials. A treatment clinical trial is a research study meant to help improve current treatments or obtain information on new treatments for patients with cancer. When clinical trials show that a new treatment is better than the standard treatment, the new treatment may become the standard treatment. Patients may want to think about taking part in a clinical trial. Some clinical trials are open only to patients who have not started treatment. Small,early-stage cancer and high-grade dysplasia of the esophagus may be removed by endoscopic resection. An endoscope (a thin, tube-like instrument with a light and a lens for viewing) is inserted through a small incision (cut) in the skin or through an opening in the body, such as the mouth. A tool attached to the endoscope is used to remove tissue. External radiation therapyuses a machine outside the body to send radiation toward the cancer. Internal radiation therapyuses a radioactive substance sealed in needles, seeds, wires, or catheters that are placed directly into or near the cancer. Monoclonal antibody therapy uses antibodies made in the laboratory from a single type of immune system cell. These antibodies can identify substances on cancer cells or normal substances that may help cancer cells grow. The antibodies attach to the substances and kill the cancer cells, block their growth, or keep them from spreading. Monoclonal antibodies are given by infusion. They may be used alone or to carry drugs, toxins, or radioactive material directly to cancer cells. Trastuzumab is a monoclonal antibody being studied in esophageal cancer. It may be given to block the effect of the growth factorprotein HER2, which sends growth signals to esophageal cancer cells. Some of the tests will continue to be done from time to time after treatment has ended. The results of these tests can show if your condition has changed or if the cancer has recurred (come back). These tests are sometimes called follow-uptests or check-ups. Laser surgeryor electrocoagulation as palliative therapy to relieve symptoms and improve quality of life. 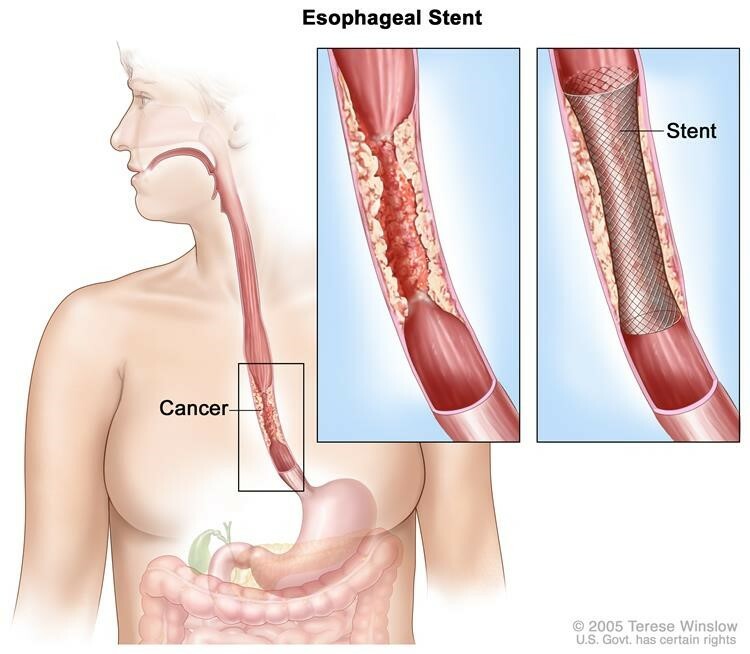 Anesophageal stent as palliative therapy to relieve symptoms and improve quality of life. Externalor internal radiation therapy as palliative therapy to relieve symptoms and improve quality of life. A clinical trial oftargeted therapy combined with chemotherapy. Use of anystandard treatments as palliative therapy to relieve symptoms and improve quality of life.